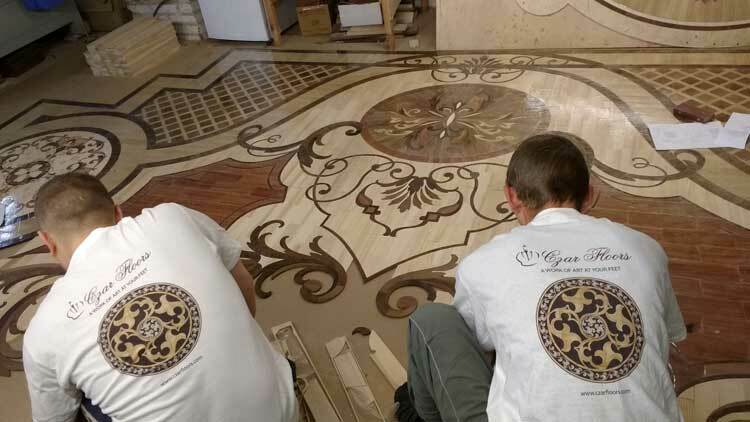 Frequently we are asked how we chose the name of our company, Czar Floors. When we began as an artisan wood products business over 20 years ago, we wanted a name that would embody the very essence of our business philosophy – treat our customers like Royals and offer the very best floors and services in the industry. Our first design inspiration came from amazing inlay wood floors we've seen in imperial palaces all over the world. We are proud of our designs and unique experience. Our company is a member of the National Wood Floor Association and Better Business Certified program. 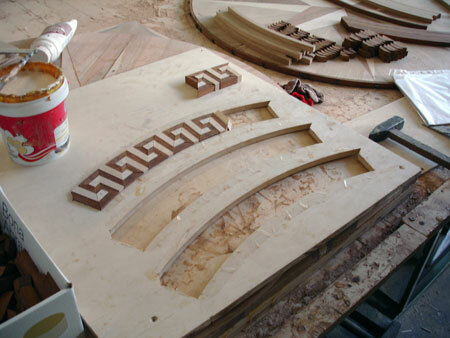 Our process uses best in the industry computerized routers to produce delicate wood inlays. 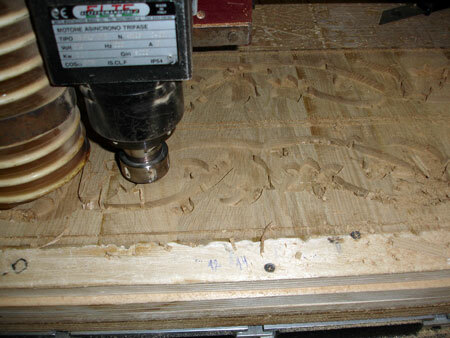 Precise CNC routing process insures a tight fit of all the parts in the inlay. The true beauty of the wood inlays is in the natural grain and color variations of the wood. Our craftsman hand assemble all the details into the final product. Every piece is inspected and carefully fit using proprietary adhesive. Precision is guaranteed by the detailed specifications, developed using Auto CAD software. 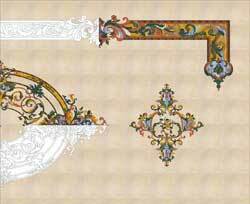 Every inlay element is designed to insure the minimal waste of the precious wood. Technology has proven itself over the years as superior to most products in the market. Read more about our products in the F.A.Q. page. 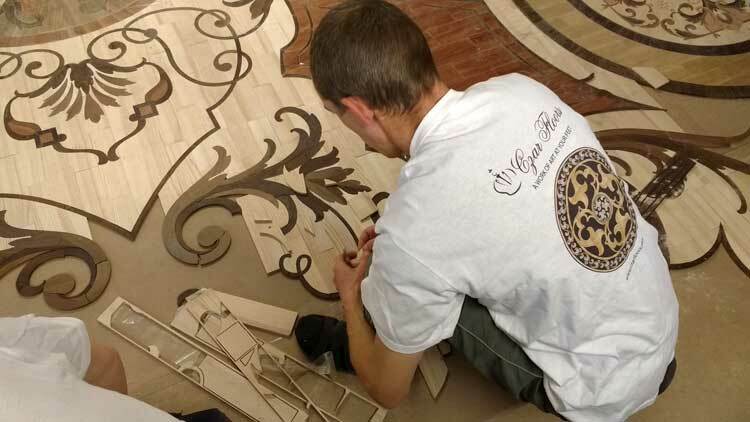 From simple medallions to whole-room intricate inlays, our craftsman meticulously check every element for proper fit, color, grain direction etc. The same concept applies to our stone inlays division. Powerful waterjet equipment cuts marble slabs into precise pieces of inlay. Czar Floors won multiple awards for its work. 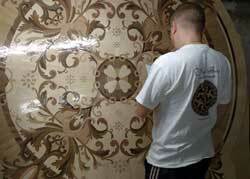 We received three NWFA awards for Best Floors of the Year in 2007. Competition yielded 215 entries from six countries. 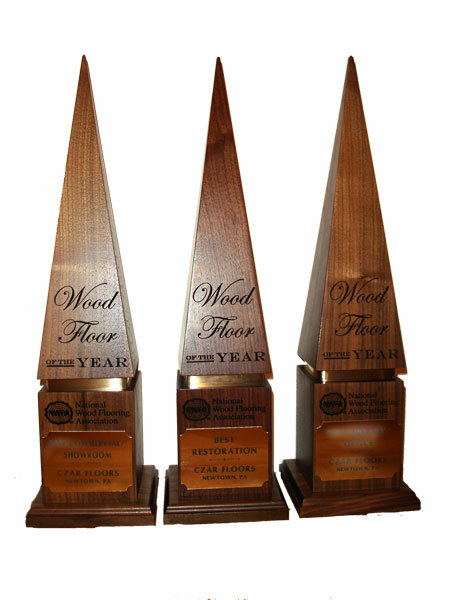 Winning entries were judged by wood floor professionals - members of the NWFA(National Wood Flooring Association) through anonymous on-line voting. Next 2008 year brought another award - Best Living/Family room. The same success was repeated in 2009, 2010, 2012, 2013, 2014, 2016. For three years in a row Czar Floors receives ADEX (Award for Design Excellence) awards for their products. All of our artisan products are hand assembled and packaged with care. 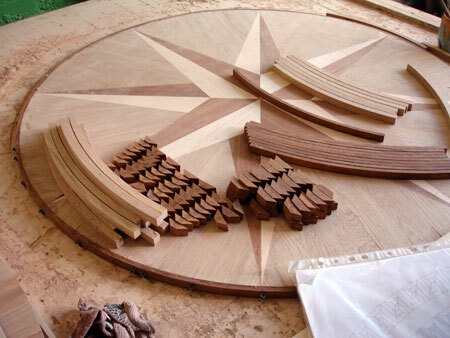 All wood and stone medallions are sealed in plastic and custom packaged to protect and prevent damage during shipping. "We had finally installed the medallion we purchased from you, and I am glad to say that is looks absolutely gorgeous!!! I would also like to thank you for exceptional service and will definitely recommend you to others! fantastic. Everyone who has seen it raves about it. the best of all the sites and had great pricing. I am a pleased customer." "..Your efforts at making this happen in a timely manner are greatly appreciated, and I think you can now add this project to your portfolio of happy customers. The medallion arrive last week and I have to say it is absolutely beautiful and has exceeded all of my expectations! Many thanks for the very fine work!